Rome is a lot. There is a lot there. 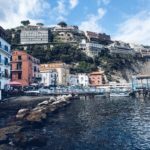 It is a very old city with thousands of years worth of history spanning across different eras in time from the Romans to the Papacy and the Renaissance to unified Italy and post-1945 Rome. I knew I would be fascinated by the history side of things (History student and all) but even I was shocked by the sheer scale of on-your-doorstep sites literally around every corner. 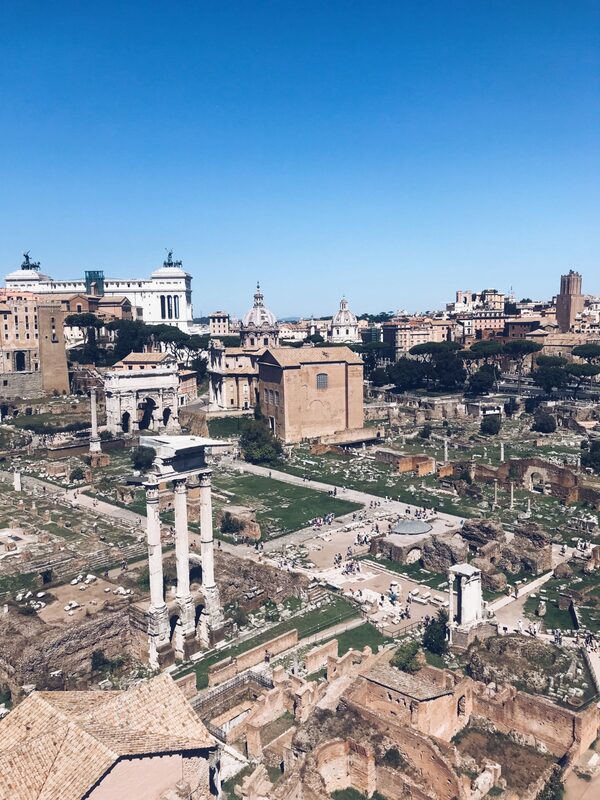 The history of Rome through the ages is blended seamlessly into the modern Italian city and you will find yourself stumbling onto beautiful and ancient things as you make your way down the sweeping boulevards and tiny cobbled streets that make up the city. 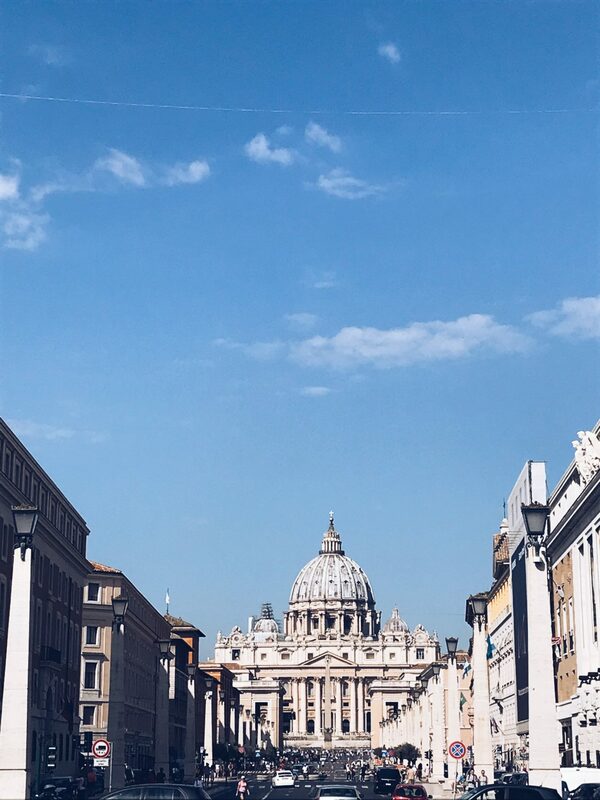 I was in Rome for 12 days which is a long time to spend in one city and it is safe to say I’ve done nearly everything that will be on most weekend visitors to-see list. Want to discover ancient and historic Rome on your trip to the Eternal City? I got you covered. 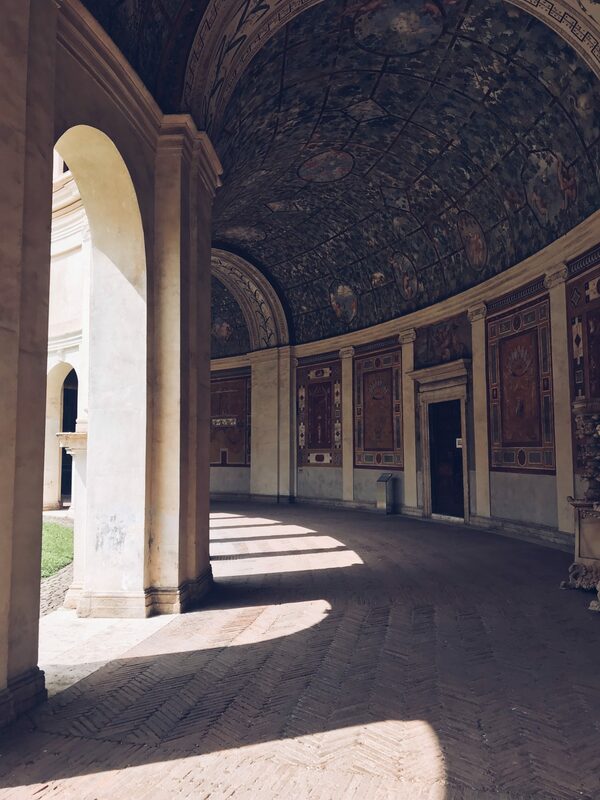 I’ve shared the top things to see in different areas of Rome so you can check things off easily and save yourself some walking. I walked around 22,000-26,000 steps a day whilst in Rome as there is just so much to see! I’ve broken down this guide into different areas with attractions that you can group together. Some of them will take a whole day but others could be combined and you could have a bumper day if you are wanting to pack lots of the city in a short space of time. I think *all* museums/sites in Italy offer a reduced entry price for EU citizens between the ages of 18-25 on presentation of your passport or similar documents. It was a life-saver for me and compelled me to visit things I might not have visited otherwise! Start on the other side of the Tiber from central Rome at Castel Sant’Angelo, accessed by the Ponte Sant’Angelo. Castel Sant’Angelo combines two super significant eras of Rome’s history, the Roman Empire and the Papacy. Castel Sant’Angelo is an imposing medieval fortress sitting on the banks of the Tiber that was originally built as Hadrian’s Mausoleum. You can walk through the ancient Room of Urns at the core of the castle before heading up into the medieval fortress and later residence that was used by the popes. 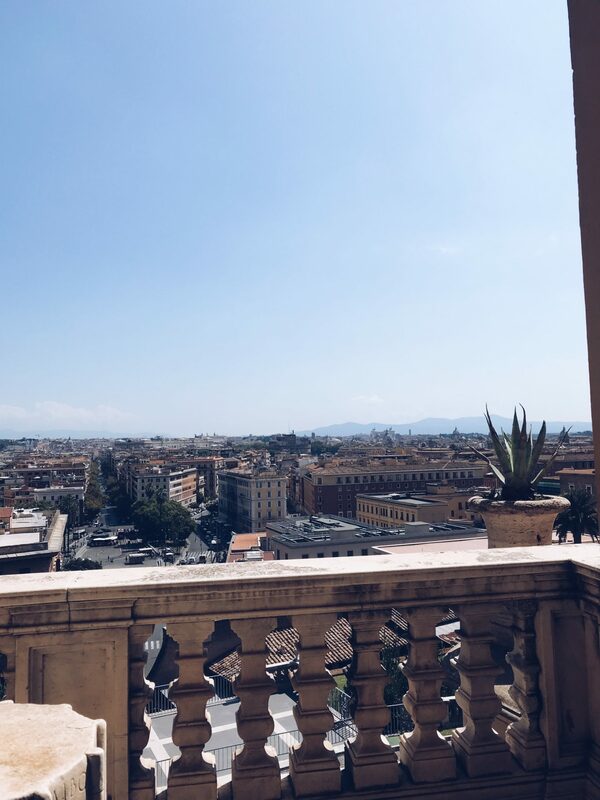 The terrace at the very top of the castle gives you a great view over Rome where you can see landmarks such as the dome of St Peter’s and the Altar of the Fatherland. You make a slow climb to the top by first navigating the the rooms of the castle which contain stunning artwork, architecture and museum displays. There is also a cafe around half-way through if you fancy a coffee whilst looking out towards the Vatican. It is open from 9am – 7pm April to September / 9am – 2pm October to March and takes around an hour and a half to two hours to see it. I can’t remember exactly how much it costs for an adult ticket (I am useless) but EU residents aged between 18-25 can get a reduced price ticket at 7.50€ if you show ID (eg. passport). I actually ended up getting in free as students of archaeology get this privilege and I showed the ticket man by proof of student status letter and explained Classics as an ancient history (which it is) so that was a win for me! 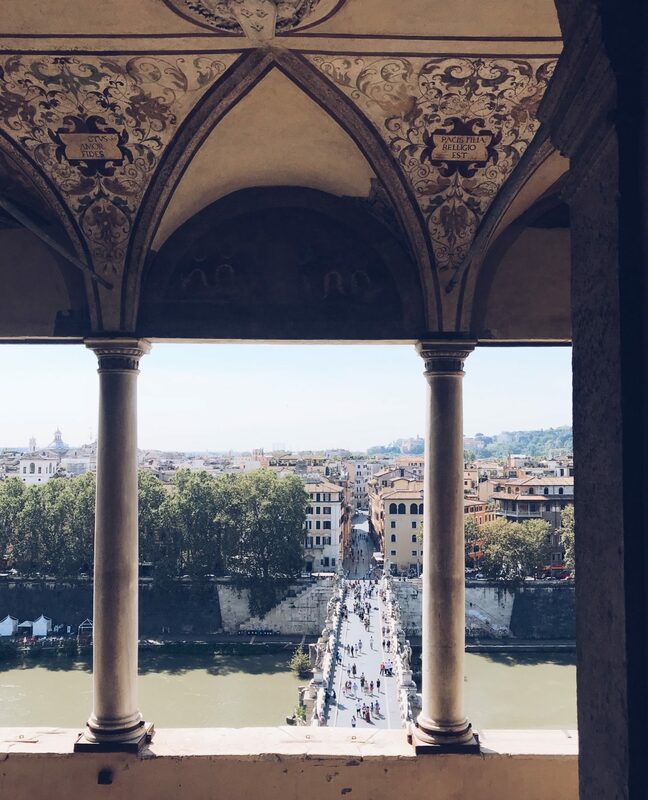 After exploring here, head back across the Tiber in the direction of Piazza Navona. 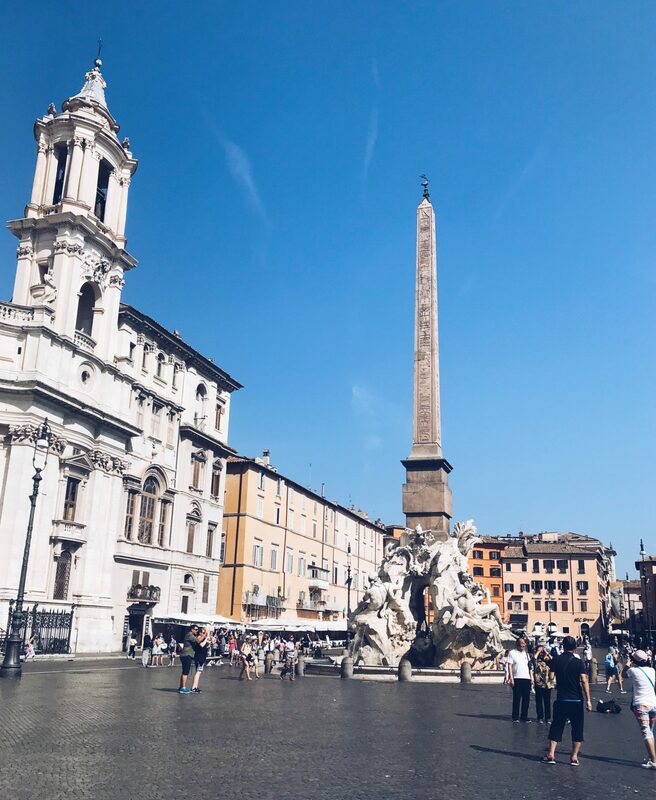 Ponte is a super cute area of a Rome and there are so many sweet restaurants around here which are so much cheaper than the tourist traps that surround Piazza Navona and the Pantheon. 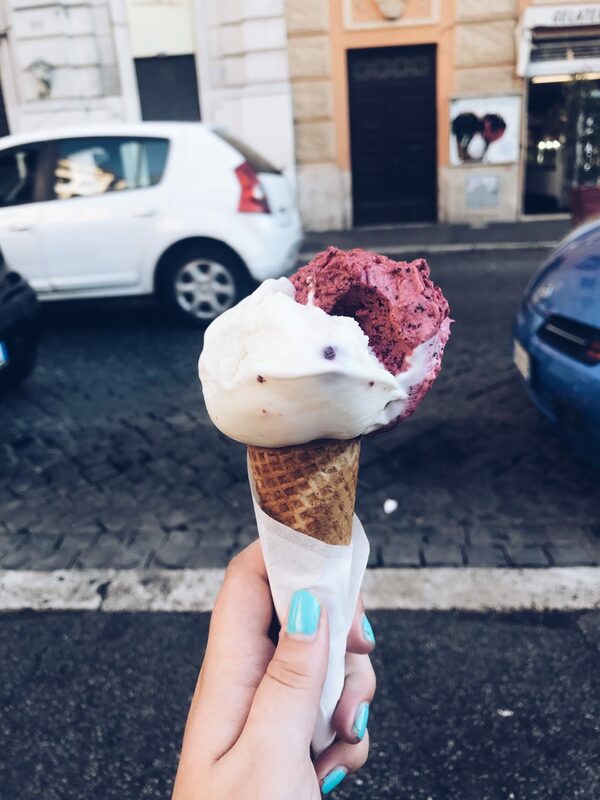 Two gelato spots to acquaint yourself with are Gelateria del Teatro and Della Palma, which has around 150 flavours including my favourite Black Forest, the only gelato flavour I ate twice. Piazza Navona was originally a Roman chariot racing track (one of the gift shops in the piazza has a model of what it would have looked like) and contains three fountains by Bernini including the Fountain of the Four Rivers in the centre. A stone’s throw from the piazza will bring you the most intact building to remain from Ancient Rome, the Pantheon. Now consecrated as a Christian church (the reason it is still in one piece)’ the Pantheon is a Roman temple thought to be dedicated to ‘all gods’ and the only natural light in the temple is the oculus in the dome ceiling. It is free to enter and it is incredible to see. Such a humbling experience when you consider it ages and what it will have seen! It’s open from 9am till 6pm which shorter opening times on Sunday. 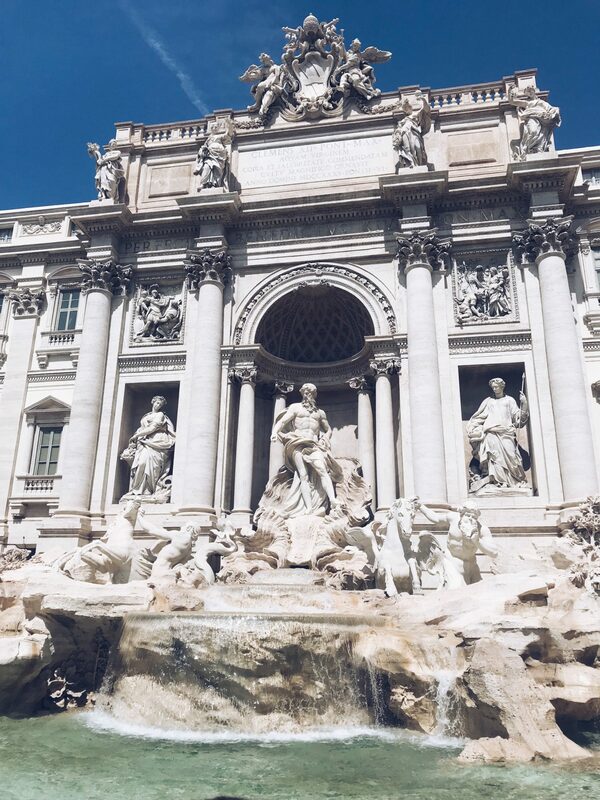 Finally, wind down your exploring in this area by hitting up Trevi to see the world renowned Trevi Fountain. It is beautiful to see with the turquoise waters pooling below Neptune. It is always packed but you can squeeze through and sit comfortably at either side of the fountain to throw your Euro in to ensure your return trip to Rome. You do have to be wary of pickpockets here due to the business of the fountain but if you want a fuss-free view pop into the Benetton shop opposite and head to the first floor window which looks out onto the fountain. 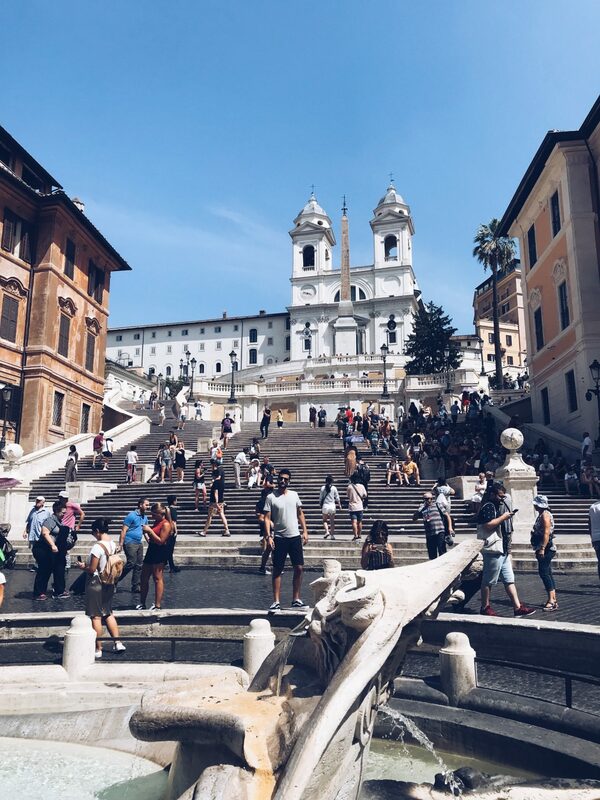 Start exploring affluent Rome by seeing the Spanish Steps which connect the Spanish and French quarters of Rome. Other points to see here include the Colonna dell’Immacolata and the Fontana della Baraccia. The area surrounding the Spanish Steps is very wealthy and the area is home to the flagship Valentino store. The Via dei Condotti is filled with designer stores including Prada and Gucci. For a taste of Ancient Rome whilst in this area, you can visit the Ara Pacis in its museum. It costs around 8€ for a reduced ticket but I think it’s expensive and there isn’t that much to see so I’d only recommend visiting if you really want to see the Ara Pacis itself. 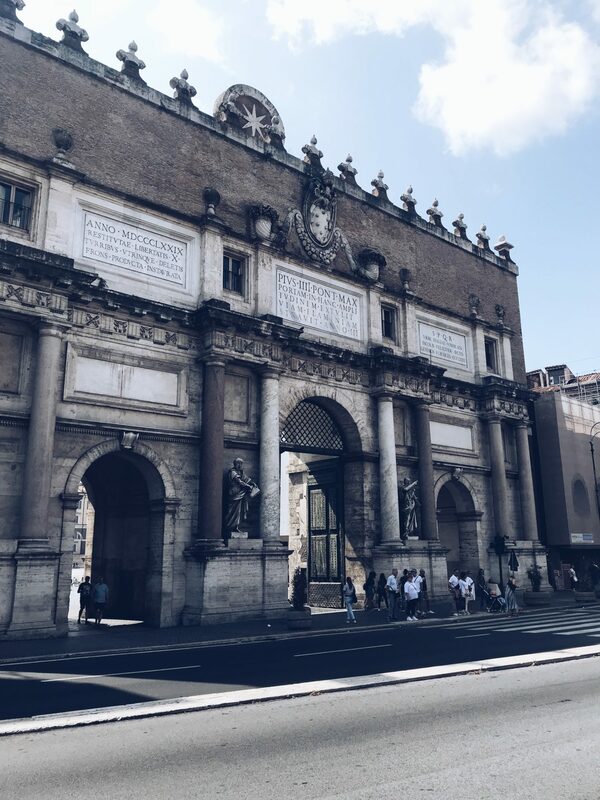 Otherwise (or afterwards), head to Piazza del Popolo to see the Porta del Popolo and stare down the Via Flaminia, one of the ancient Roman roads and original gateway to the ancient city. 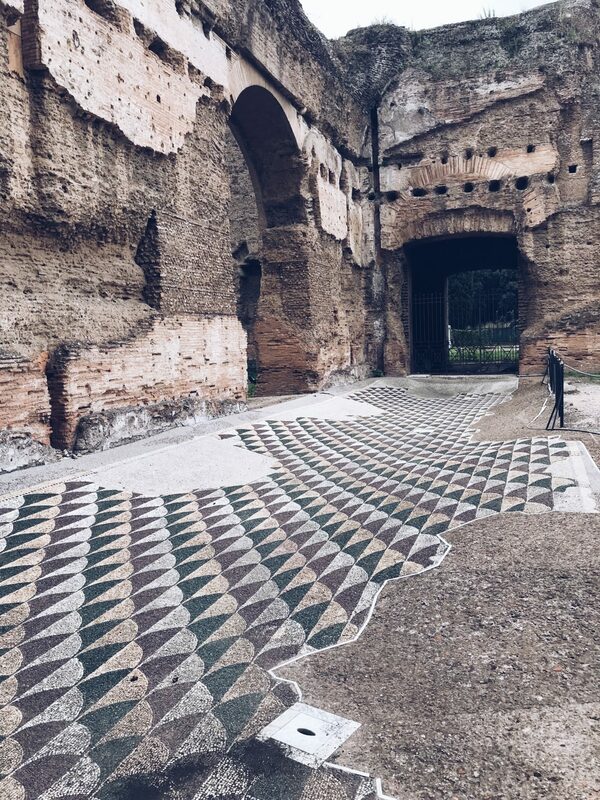 The Via Flaminia has been used by millions of visitors to ancient and Papal Rome, including the time where Julius Caesar crossed the Rubicon to march his army into Rome in the civil war that ended the Roman Republic. 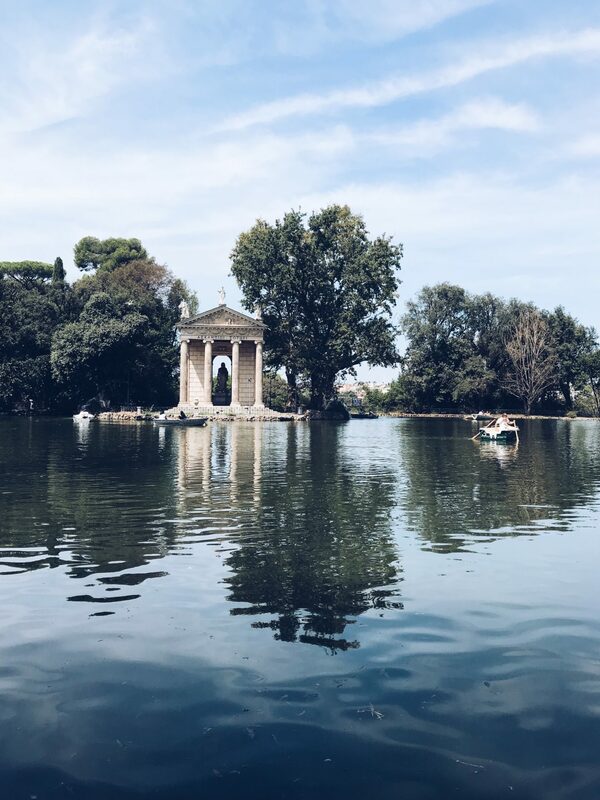 To take a break from busy Roman life, head into the beautiful city park of the Villa Borghese. It is the perfect place to take a minute, sit down and soak up the heat. The Lake Garden in particular is serene, peaceful and stunning. It was definitely one of my favourite places in Rome! A great museum on the northwestern edge of the park is the National Etruscan Museum (reduced entry costs 4€) where you can see artefacts from the pre-Roman settlements of the Etruscans, a society which was eventually swallowed into the Roman Empire. You could also visit the art gallery within the Villa Borghese itself which I didn’t do but it’s reviews are good! 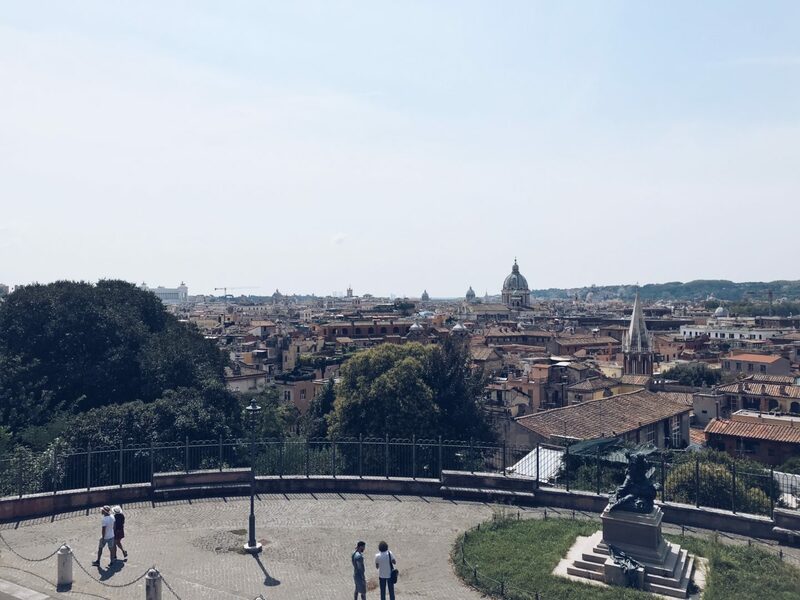 Certain viewpoints within the Villa Borghese will also give you sweeping views over Rome in all directions. 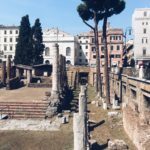 There is so much to do in the ancient historical centre of Rome you’ll want to break it up over two days. 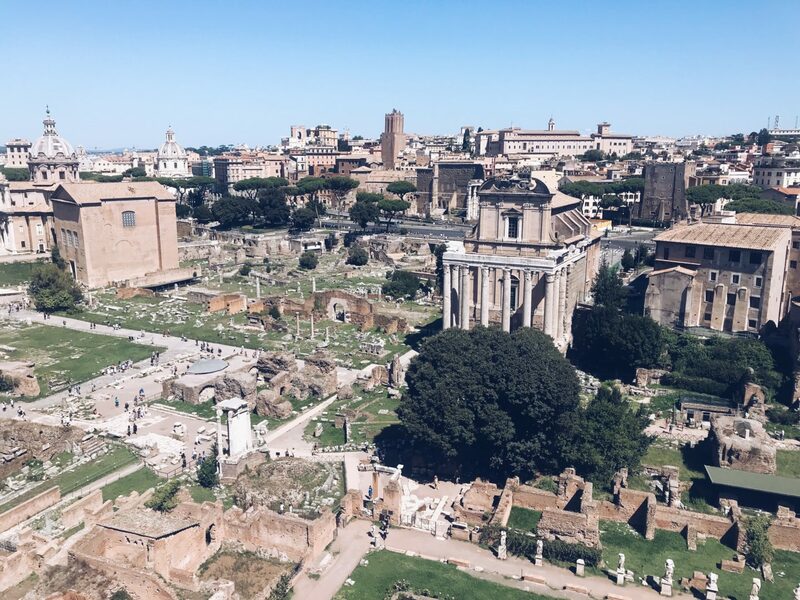 Your ticket to the Colosseum and Roman Forum/Palatine Hill is valid for two days with one entry to each site and a reduced ticket is available for 18-25 EU residents. Start near the Roma Termini train station by visiting the Baths of Diocletian, now the Basilica of Saint Mary of the Angels, which is free to enter. Not much remains of the ancient baths, the largest in Rome, but the ceiling of the basilica will give you some idea of their size and scale. Head down to the Column of Trajan, an impressive feat which chronicles the Emperor Trajan’s victory over the Dacians. Nearby is the Markets of Trajan and Trajan’s Forum which is a brilliant museum and ruins to enter (charge, reduced tickets for 18-25) and was one of my favourite things to see in Rome. From here you also get a good view over the Imperial Forum. 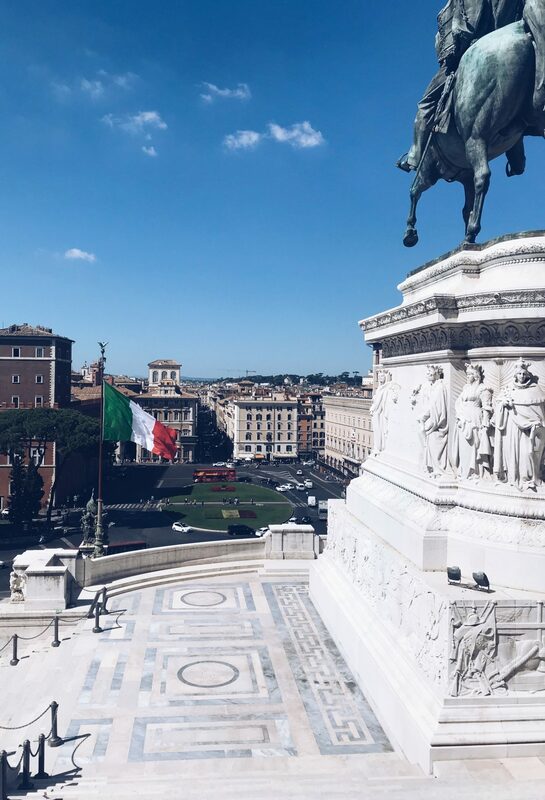 Piazza Venezia is the centre of modern Rome and sits in front of the imposing Altar of the Fatherland, dedicated to a united Italy and the first Italian Kings, and contains the grave of the unknown WWI soldier. You can travel to the top by elevator but it was unfortunately closed on the day we visited. The views are supposed to be stunning, giving you a 360 view towards both the Vatican and over the Roman Forum. It is free to enter but you can pay to enter the Italian museum inside but I would say it isn’t worth it. On the side of Piazza Venezia you can also see Palazzo Venezia, former home of Mussolini and a state palace of Italy. End your day exploring here by heading along to the Colosseum by the Via dei Fori Imperiali. If you head to the Colosseum later in the day (after 3pm) the queues will be a lot shorter and you’ll be able to use your ticket the following day to visit the Roman Forum. The Colosseum only takes about an hour to see as it isn’t a museum with things to read etc so you can navigate it pretty quickly. The Arch of Constantine also stands in the space between the Colosseum and the Roman Forum. 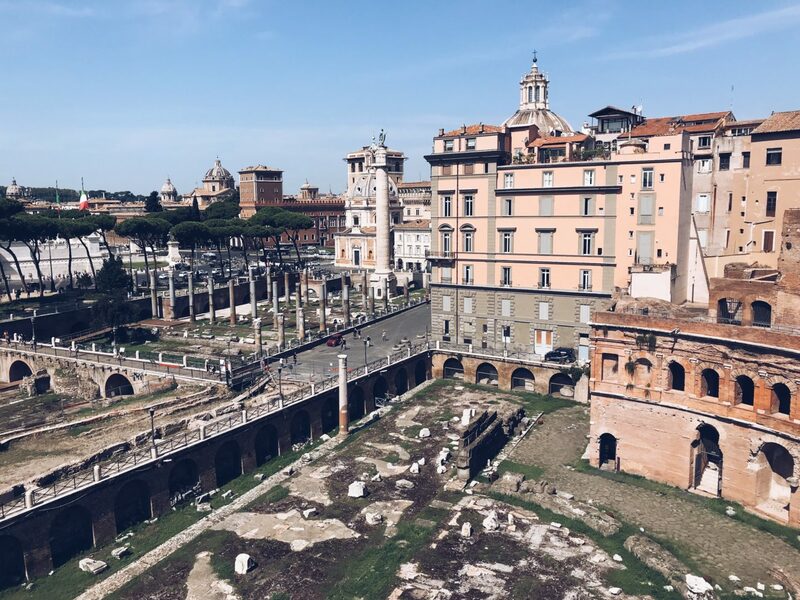 In your second take at the Centro Storico, head first to Largo di Torre Argentina. Now integrated into the road network, this site is the remains of four Ancient Roman temples that you can admire from the pavement above. It is also the home to many stray cats that I had heard much about but saw disappointingly few in the hot August heat. Head along to the Roman Forum which was one of my favourite parts of Rome. I was blown away and it really brings alive Ancient Rome before your eyes. It is hot however so try to avoid being there in the midday sun as there is barely any shade. 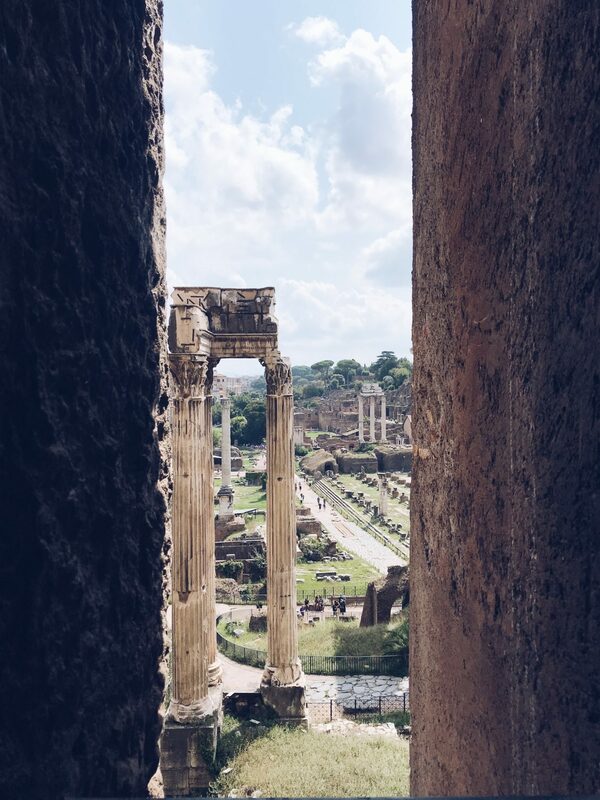 Big things to see are the Arch of Septimius Severus, Forum of Julius Caesar and Temple of the Vestal Virgins. 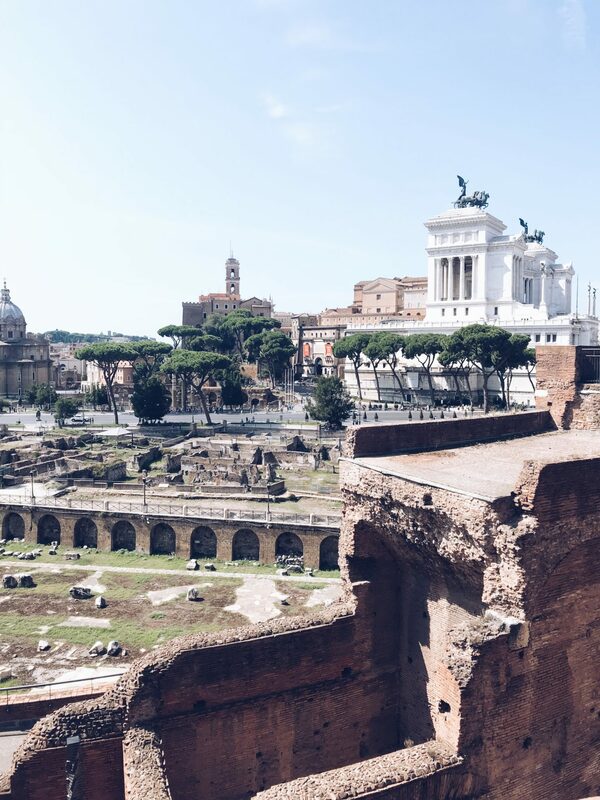 Within the Roman Forum, you can head up the Palatine Hill to see where the Emperors lived and explore their palaces. You get an amazing view over the Forum and I really couldn’t believe this was my life when I was standing up there in the summer sun. From the other side of the hill you can see across to the Baths of Caracalla and down to the Circus Maximus. The whole Roman Forum/Palatine Hill complex takes about 2-4 hours in total to explore, depends on how in-depth you want to go. 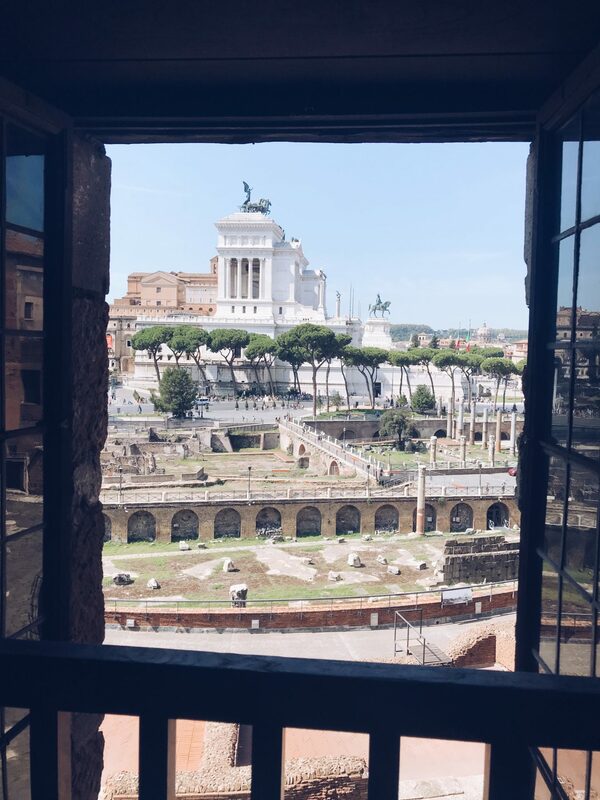 If you want to take in some air con and view the Forum from another angle, head to the Capitoline Museum on the top of Capitoline Hill where you can see the stunning statue of Marcus Aurelius on his horse, the she-wolf nursing Romulus and a Remus and see the remains of Temple of Jupiter. You can also get a fantastic view over the Roman Forum from the terrace, which benefits from being in the shade. For one final stop in exploring the Centro Storico, visit the Circus Maximus, a Roman running/games track. 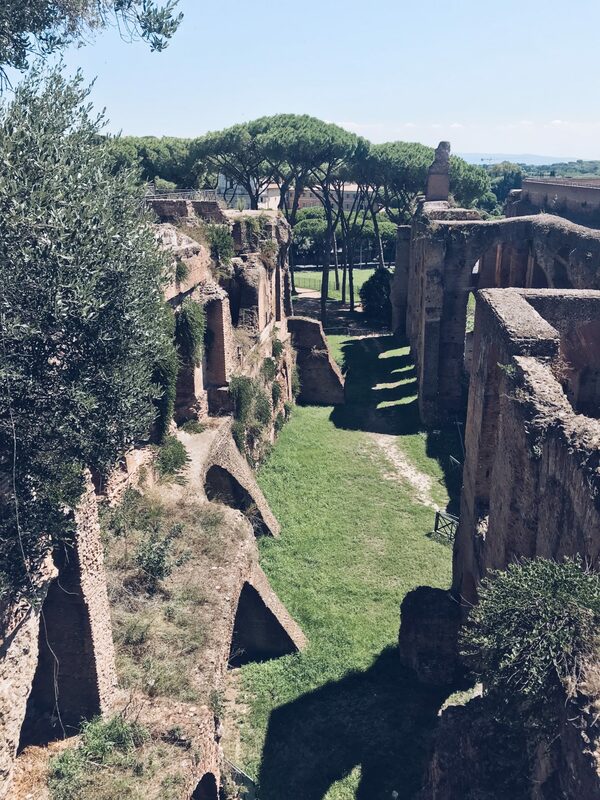 You get an idea of how the Romans used their space and it is fascinating to see up close after staring down at it from Palatine Hill. For a slightly different day, head to Testaccio. 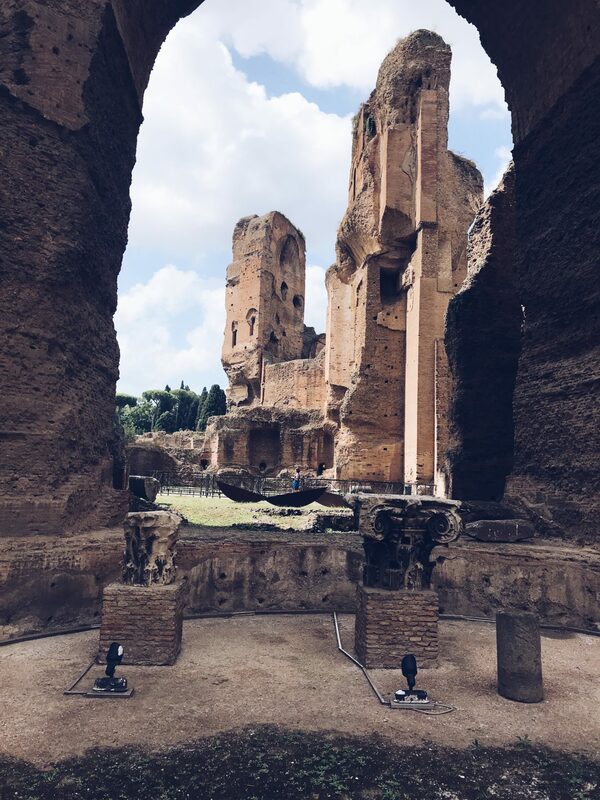 Two places to visit in this area are the Non-Catholic Cemetery and the Baths of Caracalla. 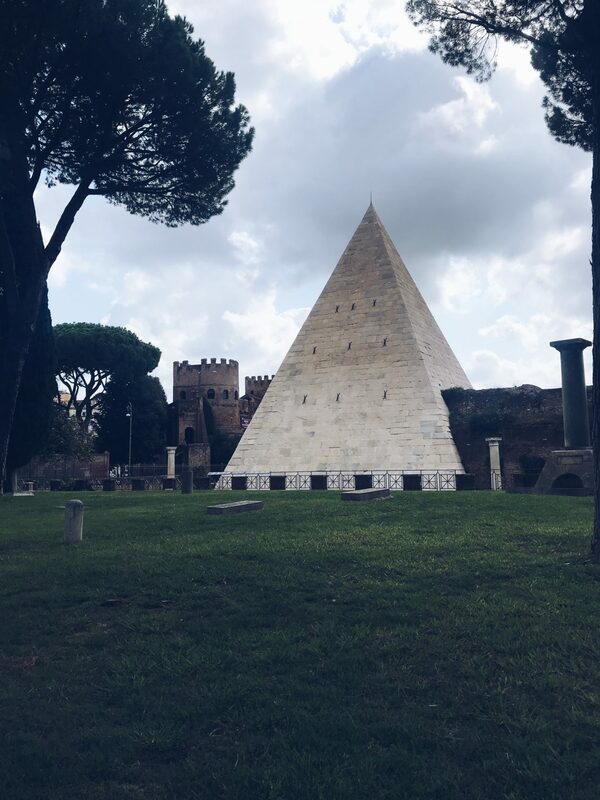 The Non-Catholic Cemetery sits next to the only pyramid in Rome – a Republican tomb which was built into the Aurelian Walls of Rome ensuring its existence. 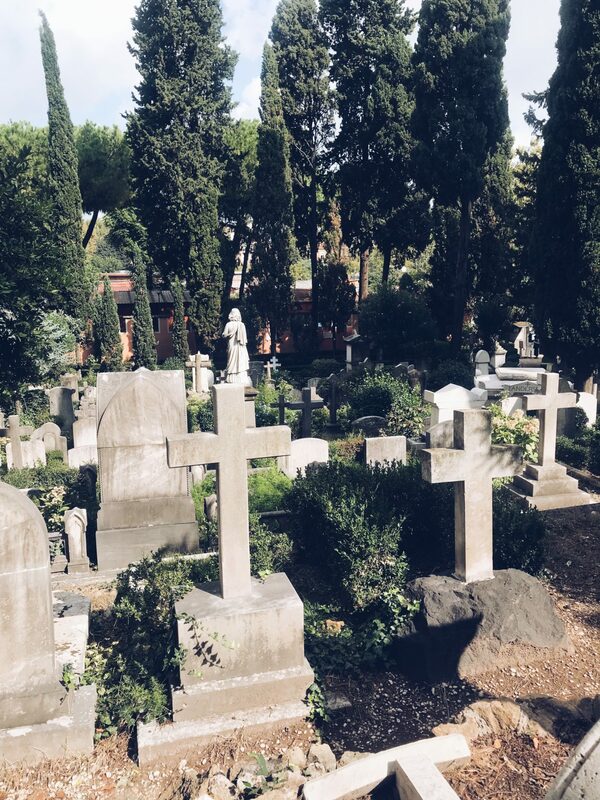 In the Non-Catholic Cemetery can find the graves of Keats and Shelley as well as plenty of cats! It is free to enter but a donation is welcomed. Slightly further out are the remains of the Baths of Caracalla. They are the best preserved Roman baths in Rome and held around 3000 people at their peek. It takes about an hour to explore the site and gives you a sense of the scale of Roman bathing when you walk amongst the ruined buildings. There is a charge but the 18-25 reduced rate applies. Explore edgy Trastevere across the Tiber, an area filled with wine bars, restaurants and chic eateries. It has a real locals feel about it and is actually where my Airbnb was located, meaning I became well-acquainted with it. One thing however I didn’t do when I was in Trastevere was hike up Gianicolo Hill for amazing views over the Eternal City. We got the bus up past there one evening and it just looked stunning. We took a whole day exploring the Vatican Museums and St Peter’s Basilica. We pre-booked tickets online for the museums but didn’t see any large queues upon entering the museum, either for entry or tickets at 11ish when we went in. The Vatican Museums are crazy busy and the first room we went into which was the Egyptian Room, the smell of sweat was overwhelming which was just lovely. 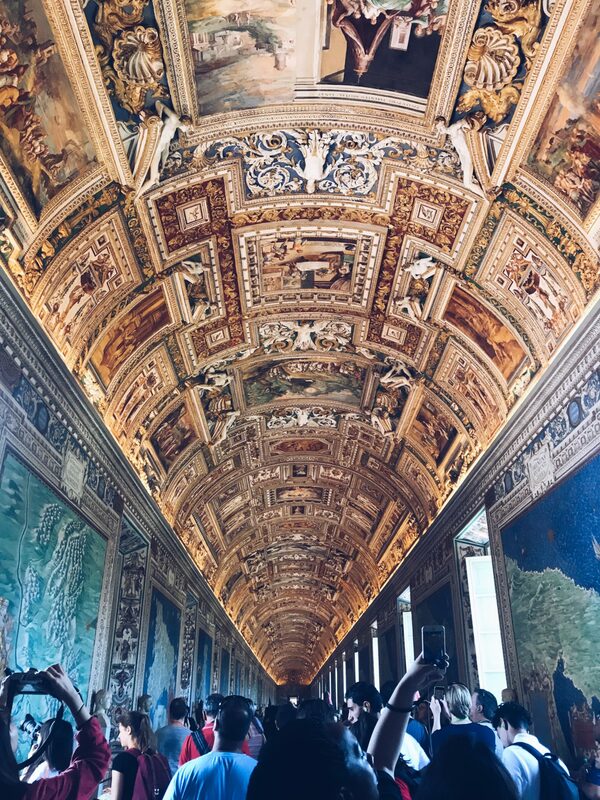 It does thin out about as you carry on through as a lot of people dash off on the short route to the Sistine Chapel instead of admiring and taking in every exhibition and room. The Sistine Chapel itself is beautiful but I felt the experience of admiring it was ruined by the sheer number of people squeezed in and the continuous hustling by the guards to move in or move along. You don’t really get the chance to just look up, be silent and take it in. We stopped for lunch in the cafe section of the Museums (there is also a restaurant and pizzeria) and sat outside by the gardens as the Museums are just huge and we were so hungry. It was more expensive than other places we’ve eaten but not outrageous and the food was good so it saved us time and my mum dealing with me in a strop because I’m starving. It took us around 4 hours to navigate the Museums including lunch and upon exiting we headed to St Peter’s Basilica. The length of the queue was the same as it was that morning and it took us around 45 minutes to reach the x-ray machines and security check point. From there the queue thins out and you can explore and admire the Basilica with ease. You can pay to go up the dome (the Basilica itself is free to enter) for amazing views over the city but we didn’t fancy the climb. Our whole day at the Vatican took around 6 hours and we were wiped afterwards. There is just so much to take in, to see and to do! And there we have, a guide to exploring ancient and historic Rome. 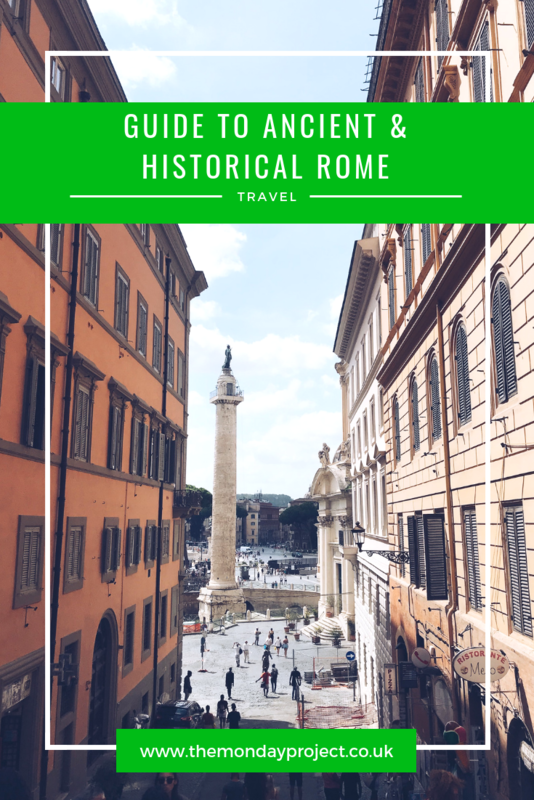 I hope it’s useful for anyone visiting and you love Rome as much as I do!